Mt. 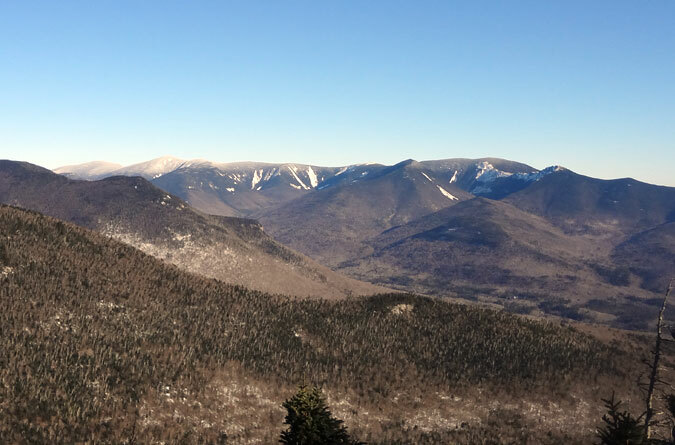 Flume offers an ideal early-season winter hike to break-in your snow hiking legs with a moderate (by White Mountains’ standards) 11-mile trek via the Osseo, Lincoln Woods and Franconia Ridge trails. I was also on the daycare pickup clock, so Mt. Flume’s quick access to the highway, ample parking, and popular, reliable hiking route that made it easy to predict the conditions, all played a part in my selection of this hike. There are several ways to tackle Mt. Flume in the winter. The most popular route is a two-peak combo via the Liberty Springs Trail up Mt. Liberty with the connection to Mt. Flume across the Franconia Ridge Trail. This is the way to go for anyone looking to efficiently knock two 4,000-footers off their winter peak bagging list as both mountains can be bagged in less miles than the Osseo route. Alas, I’d done the Liberty Springs winter hike before, so it had less appeal for me. It’s also worth noting that the path least traveled by in the winter is the Flume Slide Trail. The trail’s name alone should tell you all you need to know about it’s viability for a winter hike. The slide is best left for the most experienced winter mountaineers, and I figured it wasn’t a hike I should be doing solo…so Osseo it was! I wasn’t disappointed. At times when there’s ample snow, the Osseo Trail is perfectly suited for snowshoes. The majority of the hike is gradual climbing with truly steep sections reserved for the top third of the mountain. Here there are a series of ladders that get buried in the winter, which makes for a good spot to utilize the heel bar on mountaineering snowshoes. Given we haven’t had a lot of snow yet this year, the majority of the trail is hard-packed crust and ice, something I’ve recently seen described as “New England powder.” With these conditions I was able to scale the mountain without issue utilizing microspikes and trekking poles. The bridge crossing the East Branch of the Pemigewasset Wilderness from the Lincoln Woods Visitor’s Center. This hike begins at the Lincoln Woods Visitor Center by crossing the footbridge and starting out on the Lincoln Woods Trail for 1.4 miles. In the winter this section of the trail is wide enough to fit a car (vehicles aren’t allowed) and is extremely popular for dog walkers, cross-country skiers and snowshoers. I even saw two men skijoring (Dad, Google it) behind huskies. The Osseo Trail junction off the Lincoln Woods Trail. Hang a left just after the brook (also on the left) to enter the Osseo Trail, which begins nice and easy before gradually climbing an embankment. There are a couple rocky spots that were still uncovered and a little tricky with microspikes. The biggest issue, though slight, was hikers that had bare-booted the trail when the snow was still soft, leaving unsteady footing and the occasional post-hole foot trap. Exposed rocks on the Osseo Trail. A little more snow and they’ll be hidden until spring. The upper portion of the mountain is a series of switchbacks with ladders on the steep parts that were mostly covered by snow. In full winter they’re likely completely buried, which can add difficulty on the descent. I could see an ice axe being used here, but I managed fine and prefer trekking poles for stability coming down. Microspikes were all I used for traction, though it’s worth noting I was aided by the previous boot hikers that had cut boot-print steps into the slope. A last glimpse of an Osseo ladder before it’s completely covered in winter’s coat. The steep section of Mt. Flume’s Osseo Trail offers a sneak-peek view of the Pemi Wilderness and the Mt. Bond/Bondcliff traverse. After the steep section of the hike, the Osseo Trail flattens out for a bit before climbing once more to the trail intersection with the Flume Slide Trail, which is also the beginning of the Franconia Ridge Trail. This junction offers a nice nest below treeline to gear up and drop the pack (if returning the same route) before the quick jaunt to the exposed Mt. Flume summit. Looking south across the ridge near the summit of Mt. Flume. The final approach to the Mt. Flume summit is across a short but exposed ridge comprised of rock encrusted in ice. The drop-off is steep and the wind can be intense so you’ll want to have traction (microspikes or crampons) to prevent slipping as well as face gear and goggles to avoid frost bite. The views are well-worth braving the elements. The view of Mt. Liberty from the ridge near the summit of Mt. Flume. The Mt. Flume summit offers outstanding 360-degree views. Pictured here is the Franconia Ridge traverse (from left to right) of Little Haystack, Mt. Lincoln, and Mt. Lafayette. Not to be outdone is the view across the Pemigewasset Wilderness at Mt. Bond and the exposed Bondcliff ridge. Mt. Washington and the Presidential Range is peaking over the top. From the Mt. Flume summit, it’s 1.5 miles to the top of Mt. Liberty through a relatively easy descent into the col followed by the climb back up. I’d made it to the summit of Flume in less than three hours but didn’t dare go any further for fear of picking the kids up late. I’m still in remorse over this decision, because as you can see, I completely lucked out on the weather. Oh well. The best part of hiking is there’s always another day. Take exit 32 on I-93 and at the end of the ramp turn left onto Rt. 112 East, also the Kancamagus Highway. Approximately 5.6 miles from the exit is the Lincoln Woods Visitor Center parking lot, which has a daily parking fee.